April showers bring May flowers. Or so they say. For me they brought mud. I know, because it is ALL OVER THE SIDE OF MY HOUSE! Yep, the back of the house has artistic splatters of mud on it. Effect: pissed off mom, laughing Husband and happy kids. I was never a play-in-the-mud child. I saw this as a virtue of sorts. Or maybe it was my fear of bugs and all creepy-crawlies that live in the ground. But apparently, mud is fun! It makes you “cool” to have it all over your feet and hands. It has this magical abillity to attach to surfaces it is thrown onto. So I made something pretty. In my kitchen. With strawberries and cheesecake. Maybe not artistic and original, but delicious! The chocolate layer is rich and muddy fudgy, not cakey at all. A perfect base for a creamy cheesecake layer topped with sweet strawberry conserve. Combine the strawberries with water in a medium saucepan. Sprinkle with sugar. Cook until berries are soft and release juice. Cook 15 minutes on medium-low. Cool completely. Drop by tablespoon over the cheesecake layer. Gently spread with the back of your spoon but do not cover the cheesecake layer completely. Lightly grease or spray with cooking oil a 13″ x 9″ baking dish. Set aside. In a large mixing bowl, whisk together the dry ingredients ( flour, sugars, cocoa powder, soda and salt ). Add butter, egg and vanilla and mix with a wooden spoon, until it all comes together and forms a dough. Pat the dough onto the bottom of your baking dish. In a large mixing bowl, beat the cream cheese until creamy. Add the sugar and creamer and beat for 30 seconds. Add vanilla and yolks, beat until smooth. Add milk and beat until combined. Bake in 350 degrees oven for 30-35 minutes, until the cheesecake layer appears set and is light brown. I recommend making more of the strawberry conserve to enjoy on toast. It is much easier and faster to make than a jam. Yeah, these are pretty much AMAZING!! you've succeeded to combine three of my favorite things in one dessert, and i couldn't be more impatient to try this recipe out! Oh, Anna, these look AMAZING!!! YUM! They look sinful and delicious! I love it! You just need to come to terms w/ your inner mud-loving self. LOL Those bars look TO DIE FOR. Decadent and attractively presented! This treat looks like the perfect follow-up to a romantic dinner. Brava! 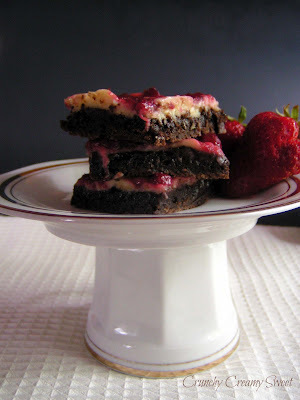 Mmm I love strawberries with anything, and particularly chocolate – great recipe! I don't have kids yet, and there's not much rain or mud in the desert, but I know when we move back to Ohio my pup will be a mess! These bars are the exact opposite of ugly. I love them! PS: I'm probably behind on this one, but your new look here is so pretty! Hi Anna-thank you for commenting on my blog! 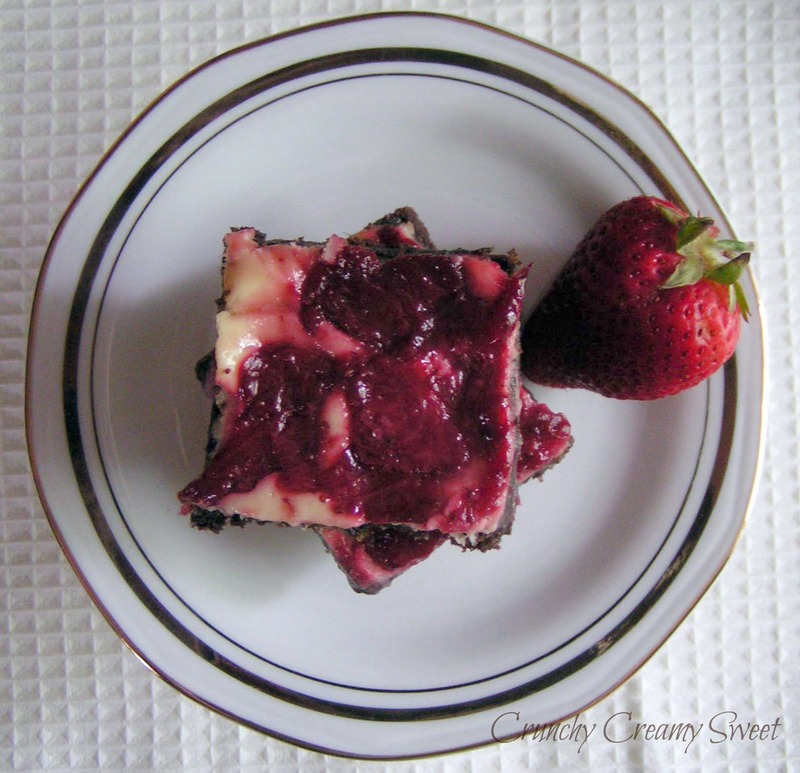 Your beautiful chocolate bars with the the strawberries are oh, so delicious, and I just love the recipe! I never played in the mud and I hate the boys to play in the mud! I would not be amused… but there are puddles everywhere today and Henry was stomping in them as he is that age and splashing mud on me. I was totally bitter! These bars look yummy! love the mix of chocolate, cheesecake and strawberries. Perfect for strawberry season. This looks and sounds amazing! Could just do with a slice now. I like your blog and am following! Ha-the hubs is laughing but I would definitely put him to work cleaning the mud off the house! I would have to find my own amusement in the kitchen rather than mud like you. These bars do look like a delicious indulgence. Great flavors and fairly easy to put together-yum! Those kids are too silly! My sons one time used charcoal and colored all over the play set like they where Indians and there bodies! I just about fell over when I decided just finish playing and I will carry you in to take a shower! These bars look nummy! They are going on the to make list! 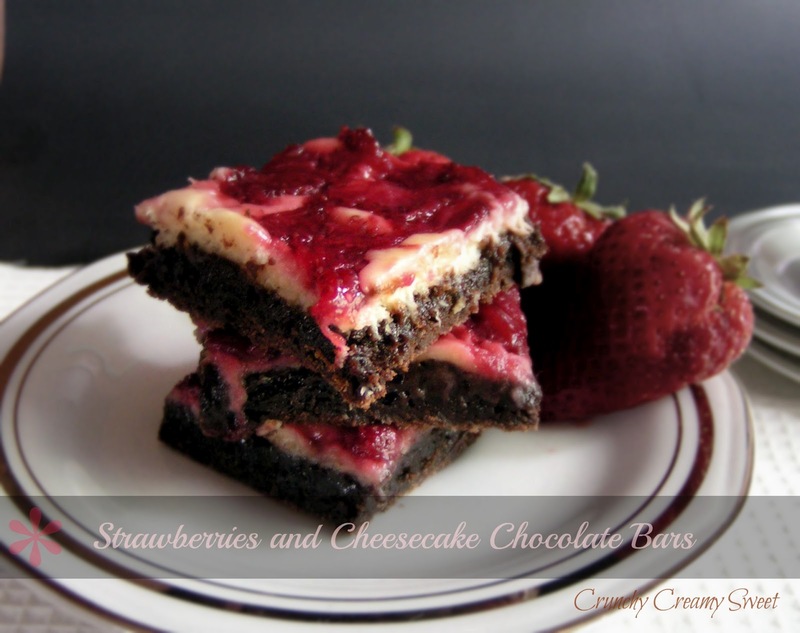 These cheesecake bars are so lovely! i love that you made the strawberry conserve too! Delicious!!! I am with your kids: I had mud all over me when I went to pick strawberries! 🙂 Don't get mad, get in the mud, you'll have a lot of fun playing with kids!